For whatever reason, the account of St. Thomas (a.k.a. "Doubting Thomas") in response to the news of a resurrected and risen Jesus Christ has captured my imagination this year more so than in year's past. I'm not quite sure why that is. I mean, it's not like I'm harboring any kind of doubts myself, but I've learned there's so much more going on in this account than simply Thomas' uncertainty. That's why there's just something about his unique experience that has intrigued me this week. So, that being said, I thought I'd share a collection of commentaries, notes, sermons, and other studies I found on John 20:19-31, the Apostle Thomas, and Easter 2 (or the Second Sunday After Easter). John 20:19-31 (ESV) On the evening of that day, the first day of the week, the doors being locked where the disciples were for fear of the Jews, Jesus came and stood among them and said to them, "Peace be with you." When he had said this, he showed them his hands and his side. Then the disciples were glad when they saw the Lord. Jesus said to them again, "Peace be with you. As the Father has sent me, even so I am sending you." And when he had said this, he breathed on them and said to them, "Receive the Holy Spirit. If you forgive the sins of any, they are forgiven them; if you withhold forgiveness from any, it is withheld." Now Thomas, one of the Twelve, called the Twin,d was not with them when Jesus came. So the other disciples told him, "We have seen the Lord." But he said to them, "Unless I see in his hands the mark of the nails, and place my finger into the mark of the nails, and place my hand into his side, I will never believe." Eight days later, his disciples were inside again, and Thomas was with them. Although the doors were locked, Jesus came and stood among them and said, "Peace be with you." Then he said to Thomas, "Put your finger here, and see my hands; and put out your hand, and place it in my side. Do not disbelieve, but believe." Thomas answered him, "My Lord and my God!" Jesus said to him, "Have you believed because you have seen me? Blessed are those who have not seen and yet have believed." Now Jesus did many other signs in the presence of the disciples, which are not written in this book; but these are written so that you may believe that Jesus is the Christ, the Son of God, and that by believing you may have life in his name. My Lutheran Study Bible has this to say in the footnotes section about these verses: "Instead of accepting the testimony of fellow disciples, Thomas remained deeply skeptical and demanded tactile proof of Jesus' resurrection. Jesus graciously accommodated Thomas's request, to his astonishment and perhaps even his shame. Jesus appears before a skeptical Thomas, who upon seeing Jesus is moved to confess Him as Lord and God. Today, we live in a skeptical age that operates by the saying, "I'll believe it when I see it!" However, in the Word and the Sacraments, we see and we do receive the benefits of Jesus' death and resurrection. Those who believe receive God's divine favor, for whoever believes has everlasting life. After Jesus's ascension, people would come to faith without seeing Jesus, on the sole basis of the apostles' witness." My Pastor, Pastor Dwayne Hendricks, pointed out during this morning's sermon the "coming full circle" aspect of how God first gave us life by breathing into us (Genesis 2:7) and today we hear about Him breathing on us (John 20:22). This is a link to an excellent verse-by-verse study from Luther's Explanatory Notes On The Gospels, pp. 399-401. Rev. Matt Richard's sermon on this passage of the text, which opens with these attention-grabbing words: "The Apostle Thomas is probably best known as the apostle that doubted. In fact we have given him the unofficial name, 'Doubting Thomas.' He was the apostle that famously said, 'Unless I see the mark of the nails in his hands, and put my finger in the mark of the nails, and my hand in his side, I will not believe.' Thinking about the word 'doubt' though, we may not properly understand Thomas’ full disposition and outlook by this one term. Otherwise stated, was Thomas the disciple who simply felt a lack of certainty? Was his faith a little bit weaker than the rest of the Apostles? Was he simply hesitant to believe? Truth be told, we must take a closer look at today's Gospel reading and note that there was a 'sharpness' to Thomas' unbelief. In other words, it wasn’t like Thomas was wavering in faith and just needed a mere faith pep rally or some motivational speaker to energize his faith so that he could be placed into the non-doubting category. No, Thomas said, that he would 'never ever' believe unless he could see tangible proof. Indeed, Thomas demanded a visible and tangible proof before he was willing to budge even an inch away from unbelief. I don’t deny that he doubted, but rather my point is that he stubbornly insisted in this either or proposition. 'No, proof, then I am quite alright not believing!' He was a staunch skeptic. But why the staunch skepticism, you may ask?" Rev. Karl Hess tells us how we unwittingly "manifest unbelief" and, therefore, make ourselves just like St. Thomas in the process. A sermon preached this week from Rev. Eric J. Brown that includes this: "Jesus has died for the sins of the world, and He has risen, and you get told about it so that you get to have life. Instead of clinging to sin and fear, you are given faith to cling to Christ and His Peace. Peace be with you! My dear friends in Christ -- this is the truth, the truth that is proclaimed in this service week in and week out, that we proclaim to each other during the week, the truth we were baptized into, the truth we sink our teeth into and wrap our lips around in the Supper -- that Christ Jesus has won forgiveness for our sins and the sins of the whole world. And we are given, as Christ's Church, the duty to sound forth the clarion call of forgiveness to the world. And we do this without judgment, without condemnation -- Jesus took that all up. If someone chooses to be stubborn and cling to their sin -- alright, suit yourself -- but we'll still be here proclaiming forgiveness. Because that's the truth, the reality. Sin is forgiven. Death is undone. And no pouting, no disbelieving spoil sport out there gets to change that truth, that reality. And as for you here -- yeah, Satan and Sin and the World are still going to try to terrify you. And sometimes they will, for in this life, you will see some pain, some fear, some doubt, some sorrow. But you know what -- over there in that window, that picture of the Risen Christ, there's Jesus, standing in the posture of blessing -- and if you look, you'll see the nail mark in His hand -- that hand held up blessing you -- nail mark right there. Yeah -- pain, fear, doubt, sorrow -- He's already seen it all, and it did its worst to Him, and He rose -- and He, the Risen Christ, is the one who blesses you, who says peace to you. And that's the reality -- and come the Last Day when He comes again, His peace will finally be the only thing you'll see, even unto all eternity. This is most certainly true. And why? Well, you know the answer -- Christ is Risen -- He is Risen Indeed, alleluia." I don't know much about the Church of the Lutheran Confession (CLC), but one CLC church in Florida had a sermon posted on their website that included a thought-provoking passage on Thomas. For instance, here's an excerpt from a sermon delivered by Rev. Mark Weis: "The two disciples shuffling along Emmaus Road mumbled, 'We had hoped Jesus was the one.' 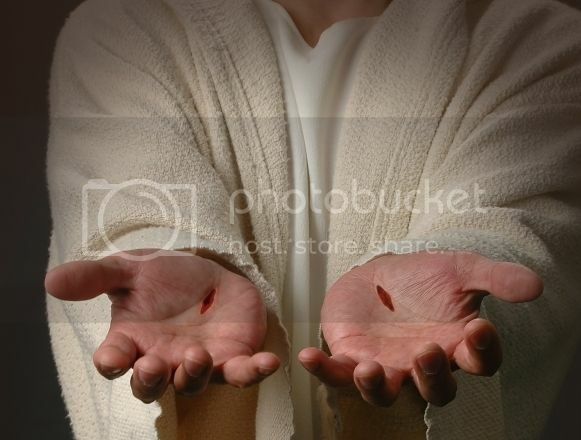 Thomas, who unfairly received the nickname 'Doubting Thomas' -- on that first Easter all the disciples doubted -- insisted: 'Unless I see the nail marks in His hands and put my finger where the nails were, and put my hand into His side, I will not believe it' John 20:25. At least Thomas was an honest doubter. It is easy for us to fault these disciples. It’s easy for us to say, 'You should have known better, Peter. You should have trusted more, John. You should have been more hopeful, Mary Magdalene. You should not have doubted, Thomas. Jesus told all of you that He would rise from the dead. He meant it. And besides this, all of you saw Him perform miracles. You witnessed Jesus walk on water and calm storms and feed thousands from scraps of food and heal the sick and raise the dead. You had all the right facts. You drew all the wrong conclusions. Shame on you.' But then, have we not witnessed the same miracles of Jesus in the pages of Scripture? Have we not been given the indisputable testimony of Christ’s resurrection? Why then do we at times still live our lives in fear and anxiety, despair and hopelessness? When we do, are we not thereby acting as if Jesus Christ were still dead and buried instead of living and ruling? You may be thinking, 'Well, that isn’t a fair comparison, Pastor. After all, those first disciples actually saw the risen Lord. They clasped His feet. They watched Him eat and drink to prove He was no ghost or hallucination. And Thomas was permitted to touch the nail-prints in Christ’s hands and feet and the spear-wound in His side. We have not been able to do such things. All we have is the testimony of Scripture.' All we have is Scripture? Shame on us. Let me remind you what the risen Lord said to doubting Thomas: 'Put your finger here; see My hands. Reach out your hand and put it into My side. Stop doubting and believe.' And Thomas replied, 'My Lord and my God!' And then Jesus said, 'Because you have seen Me, you have believed; blessed are those who have not seen and yet have believed' John 20:27-29. After recording these words of Jesus, the apostle John went on to write in the next verses, 'Jesus did many other miraculous signs in the presence of His disciples, which are not recorded in this book. But these are written that you may believe that Jesus is the Christ, the Son of God, and that by believing you may have life in His name,' John 20:30-31. How sad, lost, dispirited, weak, forlorn, and hopeless those first disciples were after the death of Jesus. But then the resurrection of Jesus Christ changed everything. Everything! When they saw their risen Lord, fear became confidence; sadness became laughter; dead hope became living hope; tears of despair became tears of joy. Because of the resurrection of Jesus, women who went to anoint a dead Savior left His tomb rejoicing in their living Lord. The two disciples walking sadly to Emmaus raced back to Jerusalem with the tremendous, exciting, and overwhelming news, 'Jesus is alive!' Because of the resurrection, Simon Peter, who once out of terror denied knowing Christ, boldly proclaimed Christ in the very city in which Jesus was crucified. It’s Greek Tuesday! Alleluia! Wait, that might be a bit much… Anyway, this week Pastor Fisk discusses John 20:19-30 with the disciples in the upper room after the Resurrection. Jesus teleports in, Nightcrawler-style (sorry, John Calvin, he doesn’t climb in through a window), he gives the disciples the power to forgive sin, and then Thomas has his unbelief physically destroyed. All that and a few tangents and rabbit trails make this Greek Tuesday! Greek Tuesday, John 20; Doubting Calvin, Pagan Thomas, Aramaic Copulation, Jesus sticking his Side in You and more! Maybe it's because of the dichotomy between "doubt" and "faith" which doesn't get any more "black-and-white" than that for us Christians, but whatever it is, it's truly a fascinating study as these resources prove. No one should be forced to receive the gifts of Christ. If our need and the greatness of the gifts don’t compel us to come to hear God’s Word preached, or to baptize our children, or receive the Lord’s Supper, or go to Bible study, or read it at home, or confess and be absolved, external force won’t help. It would be wrong for me, however, not to show you the greatness of Christ’s gifts and remind you of your need. But mostly I preach this for those who see their need for it and desire the blessing, but who are afraid or ashamed; I preach this to encourage you to come. I cannot invite you as graciously as Jesus invites you; I wish I could. I can tell you that Jesus welcomes sinners and those who are weak in faith. He wants them especially to receive His comfort and pardon. I can tell you that the greater our sins appear to us, the more worthy we are of condemnation, the more graciously Jesus invites us to come to Him. When we come, He will not only forgive us. He will wipe our guilt and shame away entirely. He will make us reign with Him, seat us above the holy angels, make them our servants. I can tell you that when Jesus showed the disciples His hands and side He didn’t do it simply to show it was Him, nor did He do it to remind them of their sins. It was also an invitation to them to consider how sincerely He loved them and had how completely He had forgiven and put away their sins. The place of the nails and the spear in His body are seals to us that we no longer have anything to fear, but have peace with God that can’t be taken away. By those same marks Jesus invites and urges us to come to Him so that we may hear Him say, "Peace be with you". I pray that you will hear His invitation and recognize that when He opens His Word, bestows His Sacraments, and absolves us, He comes into our midst with peace as He came into that locked room. And when He does so He enables us to leave our locked rooms and go forth into the world with His peace to reign with Him. Alleluia! Christ is Risen! Personally, I'm struck by the persistent theme this week that reminds us that Christ's divine nature is not limited by His human nature. In a Lutheran layman's terms, it's about continuing to remind us that our sins are forgiven, because Christ is risen!